t. kilgore splake was born as thomas hugh smith in 1936, in three rivers, michigan. 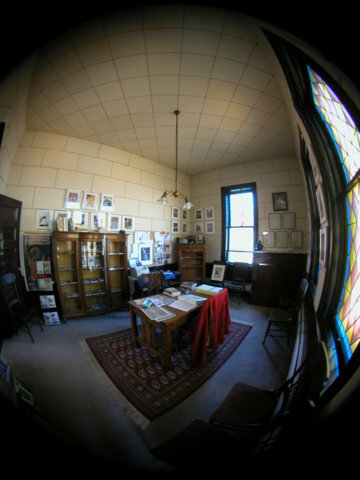 while teaching at kellog community college in battle creek, splake began writing poems. in 1989, he chose to take an early retirement as a college professor to live in creative poverty and find his poetic voice. upon retirement, he moved to michigan’s upper peninsula, living for ten years in munising, before moving to calumet in the keweenaw peninsula. 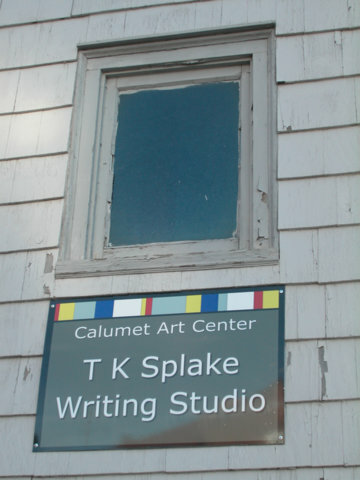 presently, splake resides in an old tamarack location ‘row house’ in the ghost copper mining village of calumet. in his twenty years of artistic creativity, splake has become a legend in the small press circles for his writings and photographs. his artistic supporters believe splake possesses and original creative vision and language as well as exhaustive working habits. 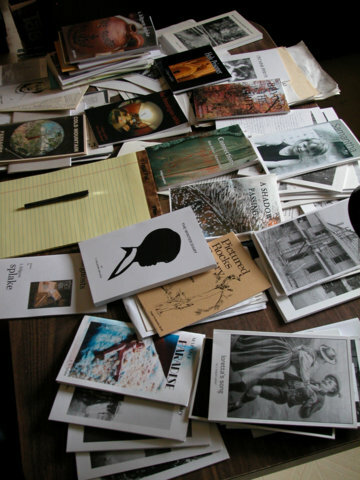 for four years, splake shared the editorship of a small press literary journal, cliffs soundings, with the upper peninsula potter jikiwe. splake has published three chapbooks of his black-and-white photographs, available light, shadows visible, and lightness of being. this past year, working with mike edwards of “red jacket technology”, he completed another dvd movie production title, splake: pictured rocks poetry. 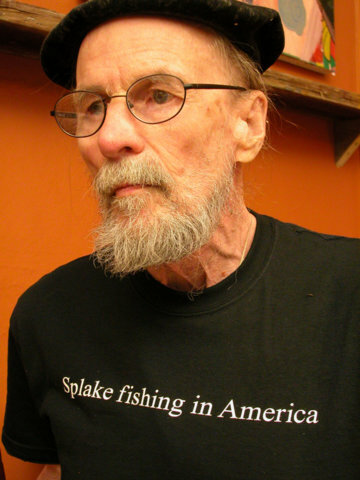 splake’s most recent publications include, splake fishing in america (presa press), rosetta poems (shoe music press), autumn shadows (the moon press), and grand marais (gage press). the grand marais production also contains a dvd of splake reading his poetry. currently he is working on his “deathbed” memoir, a collection of past poems to be published by presa press. in addition, he has manuscripts under consideration with “shoe music press” and “street corner press.” gordon purkis, editor of shoe music press, is reviewing the room, a new collection of splake poems. robert zoschke of “street corner” press is reading the poems and prose works from the manuscript splake’s tales. as a divorced father paying child support and a burned out college professor who had grown weary of his job, i used to escape summers to the pictured rocks wilderness area in michigan’s upper peninsula. i would camp in remote areas between the small communities of melstrand and grand marais. it usually took about one week for me to feel relaxed and forget the tension of the college classroom lectures left behind. h0wever, shortly i would be turning dusty adams trail miles in the old ford bronco, with a six-pack of blue ribbon, wedge of sharp cheddar, a dozen nightcrawlers, and looking for a new trout fishing stream. always too soon, it would be labor day with the summer finished, and i would be heading back below the bridge to battle creek and my teaching position. lacking any logical explanation, early one summer morning while drinking my first cup of coffee around the campfire embers, i wrote two or three poems on a paper plate. at that moment it suddenly occurred to me that i had always been a poet and i was simply waiting for this experience to happen. i now feel like doris lessing, who said that after she began writing she felt as if her whole life was beginning. the summer i began writing poetry was the same time i caught a trophy fish in sable lake that the grand marais locals called a splake. during this vacation i also read all of the dell publishing company’s publications of kurt vonnegut paperback books. in breakfast of champions, vonnegut had a character named kilgore trout. following my summer of writing, the idea of a male, political science professor being a poet seemed like a frightening idea. i was scared that my work might really be bad, so i searched for a convenient nom-de-plume to hide behind. putting together the “t” from my name tom, kilgore from the vonnegut character, and splake from my sable lake angling prize, and presto, tom smith became t. kilgore splake. during the fall of 1979, i reviewed, polished my summer writings, and published my first chapbook, pictured rocks poetry. of course, my early poems were quite “woodsy”, with many observations about my pictured rocks outback adventures and thoughts during the brief summer days. the early wilderness poems are a few example of my first poems.